Republicans are proposing to cap federal spending to 18% of GDP. The last time federal spending was that low was in 1966. It just another really stupid Republican idea from people who completely ignore reality. The Center for American Progress has provided a chart illustrating five different budgets that would be required to get us to that level of spending. 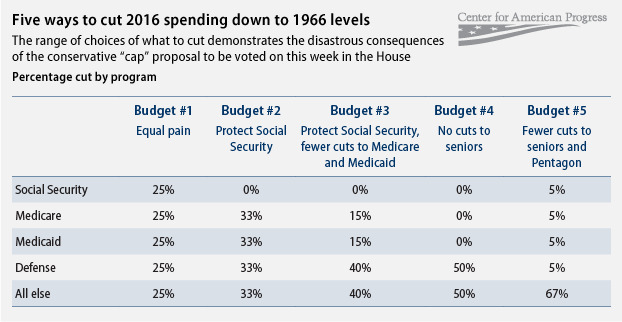 As the chart indicates, to get to the level of spending Republicans proposed we would have to either make massive cuts in Social Security and Medicare or massive cuts in Defense spending and spending upon everything else. So which of the five options would you prefer? If you say, “None” then you join the rest of us. Capping spending as Republicans propose is a fantasy. It could not and will not be done. There is another reason we will not and cannot get to 18%. Our country has changed a lot since 1966. Among other things, a larger percentage of the population is over 65 and they are living longer. Spending on health care and prescription drugs are much higher. Many more people live in poverty and so on. All of these realities of living in 2011 as opposed to 1966 drive up the cost of government. Republicans may want to turn back the clock to the 1960s, but that is not going to happen. Like it or not, they and we must live in the real world, not the fantasy world of long ago. Check out the following graphs on how America has changed since 1966 from American Progress.